I'm not exactly sure what to make of this book honestly. Everything about it - the characters, the plotlines, the relationships, even - caught me in surprise, and pretty much throughout the novel I had no inkling what was going to happen next. I expected love to blossom between the two main leads, but what I got was the exact opposite - they honestly can barely stand each other! I expected a fun story full of witty and snarky remarks exchanged between Jeff and Kimberlee, and while I did get that, I didn't expect the message that the novel wanted to get across to be poignant and something that you would want to ponder for a while. This isn't a book that would offer you answers about the afterlife, or why exactly is it that only Jeff could see Kimberlee. Instead, this is a novel that would allow you to linger on the consequences of one's actions, and maybe, just maybe, it isn't too late to do something about what you did wrong in the past. Jeff represents a chance for Kimberlee to right so many wrongs, and I really can't blame Kimberlee for doing absolutely anything she can to have the assurance of Jeff's help, but my perspective definitely shifts as I continued reading the novel. I love how Pike subtly drilled to her readers just how powerful an emotion sincere remorse and just how much one can achieve through it. I was also particularly impressed with how Pike explored the concepts of doing something you have to do as opposed to doing it because you actually want to through both Jeff and Kimberlee's characters, and how massive the difference is between both notions. Pike ascertained that being forced to do something can only contribute to the failure of your ultimate goal. Jeff never wanted to help Kimberlee out - he was only forced to do so because she threatened to haunt him forever if he didn't; on the flipside, she to return the things she stole simply because she believed there was no other way for her to move on otherwise. The aftermath of Jeff and Kimberlee's choices - choices that were driven by the wrong reasons; the wrong motives - slowly make themselves known throughout the novel. I love how Pike developed Jeff and Kimberlee's characters through their complicated (and rather difficult to define) relationship. They helped each other grow - through each other, they learned how to see the world with more knowing eyes, and at the same time they finally figured out how to see themselves for who they truly are. Jeff was a bit of a pushover towards the beginning, but the scene wherein he finally tells off Kimberlee (and in the process tells her something that she has needed to hear for a long time) was rather riveting and eye-opening. Life After Theft was easy to read. It was difficult to put down, and Pike did a great job with the pacing of the novel. It wasn't too fast-paced that I got a whiplash with every turn of a page, and it wasn't too dragging that I had to fight to keep my eyes open. I also liked how Pike addressed Kimberlee's kleptomania - I actually got chills when Kimberlee tried explaining to Jeff how she can't stop stealing, and furthermore, how she describes her feelings when she takes the things other people hold dear was just excellently written. This may not be your usual YA paranormal novel, but it's one that gets the author's message across perfectly. I've heard mixed review about this one, initially I loved the premises but when it came out that the narrator was guy, I was put off a little by that (I know, stupid reason). Though I love that she's a kleptomania, that would make a fun story. Lovely review, Lyra! Yay I'm glad you enjoyed this one! I really loved the characters, too, and I thought their development was so great :) It was kind of like a fluffy froufrou book, but at the same time it had a lot of content and substance. From the cover, I actually thought it was a contemporary, and it actually kind of was, too! 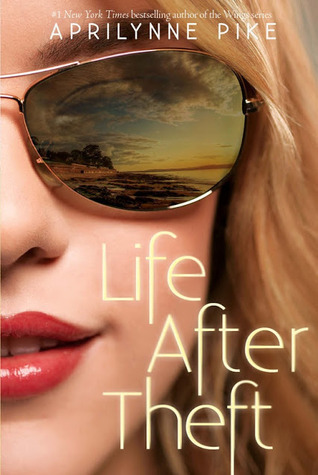 Life After Theft sounds super interesting but I haven't got a chance to read it yet. Maybe I should look more into it :) Thanks for your review! good to know some new releases! thanks for sharing this great review!! I have a copy of this one, but haven't had the time to read it yet. Glad that you enjoyed it. Thanks for sharing your thoughts! Eeeeee! I want this! Nice review Lyra! Miss you! Unfortunately, I don't think this author is going to work for me. I really struggle with her writing style. I've come to the conclusion that it's just not my cup of tea. Ah, Aprilynn Pike. I want to read this and Wings, too.